This fast-paced imaginative game is an interactive dice game of strategy and defense that pits players against each other in an attempt to win with the highest score. Once you've played a round of Stack you'll agree that it's a great game! Any flat surface is the board, just throw out the dice and "let the good times roll!" The more sets of dice colors you have, the more players can play. Stack was awarded "Best New Family Game" by Games Magazine. Dice comes in four colors: Red, Yellow, Blue and White or Black, Purple, Green, and Pink. 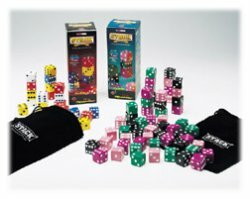 Each Stack set includes 56 standard multicolored dice and 1 Stack Sack.